In Everway, Jonathan Tweet laid out a model for resolution of uncertainty in RPGs that's been pretty foundational to a lot of thinking. Basically, when faced with a moment of uncertainty (such as a conflict) there are three factors that play into resolving it. The first (Karma) could broadly be described as capability, which can include situational elements in the fiction (you're attacking someone from surprise) or mechanical differentiators (You have a higher sword skill than the guy you're fighting.). Basically, it's rules + situation. There's no right answer to how these should be combined and prioritized - the categories are just useful for discussing what different systems take advantage of. Now, a certain kind of anime throws this for a loop, specifically, the broad swath of anime centered around fights. I've touched on this, but I want to call it out specifically - the bulk of anime fights _look_ like they're determined by Karma (in the form of strength and cool powers) or maybe drama (because the hero has to win eventually) but their specific frame is about Will. The hero wins because his will to win is strongest. This might be an avenue for revealing things about the character (such as why they need to fight) or valuable lessons (I'm fighting for my friends, that gives me strength) but nothing demands that be the case. This is kind of messed up. It's got a slightly creepy will to power vibe coupled with what is a kind of immature idea that whoever wants it more gets it, not because that want has made them work harder or prepare better, but simply because they want it more. On a practical level, this is really problematic in play because while players can conceive of a failure in capability, it is very hard for them to conceive of a failure of will. Yes, there are exceptions, but the player willing to say "My character gives up" is a rare thing. It also makes inter-party conflict kind of lame. Now, yes, you can mechanize will, make it a pool, blah blah blah, but doing so misses the point of why this is viscerally appealing. We like the idea that sheer gumption can carry the day. It's kind of like lottery thinking, since it's a path to victory without the boring stuff, like work, and games are about avoiding the boring stuff, right? Well, yes. In general. But the absence of pushback, resistance and other "boring" things makes for a kind of unsatisfying game. All of which is to say, that fighty anime remains a great source for inspiration. I'd love to try powers systems as colorful and elegant as many of those I see on the screen. But emulating it is much harder than it looks at first glance. One of the neater little susbsystems on Road to Amber is something that equates to an automated system of sealed envelopes. The player receives the meta-object, which contains any number of seals, often sequential, but sometimes parallel. Each seal has its own requirements to be opened, such as being in the right place, using the right skill, or just spending enough time on something. Once the seal was opened, the player would get some information, and perhaps something else would be triggered (like a change elsewhere in the game, or maybe opening up a new power for purchase). I'll take some credit for the idea, but Fuzz/Amberyl actually made it work, and work well. There are a lot of things this lets you automate as an online GM. For example, if you want to do a murder mystery without having to run every scene, you can hand someone a packet with a seal for each room in the house, containing the clues that might be found there. Designed well, the seals might demand cooperation or collaboration from players, and thus drive play. It's good tech. In and of itself, it doesn't translate well to the tabletop. It is, ultimately, a tool to help allow play when there's no GM around which is much more of an online (or LARP) concern. Still, it came to my mind when thinking about sealed envelopes after some conversation that @SarahDarkmagic had on twitter. See, the underlying idea is pretty simple, and probably best exemplified by Lore Sheets from Weapons of the Gods. At the start of a campaign, during chargen, the GM can create a stack of interesting hooks and spread them on the table, allowing people to pick one or more of them as something that player is interested in. The example from the twitter conversation is "Recover my father's sword", and I find it a nice, clear expression of the idea. Now, the idea doesn't just stop there - there's a large question of what you do with it. For example, are these hooks going to define the campaign, or are they going to be the B plots? Either approach is appropriate, but it's important to go into that with the right expectation. Similarly, there's a question of mechanical hooks. There's nothing that _requires_ these hooks have a mechanical element, but I think it's much cooler when they do. What exactly those hooks are depends on the game. Weapons of the Gods has a whole neat little system in place that also ties into buying the most powerful weapons in the setting. In 4e, you could probably use the backgrounds as hooks (provided you did cool backgrounds, like the ones in Neverwinter). All well and good, but I find myself curiously dwelling on the *physicality* of the choice. And that's what got me thinking about sealed envelopes. It's no secret that I love cards in chargen. The element of concrete choice paired with the capability for randomness is just incredibly important in my mind. One of the elements of these hooks is a certain amount of information compression. The hook itself is quite straightforward - easy to write on a card - but the associated data and mechanics are usually much more involved. Maybe that extra information is hidden until it gets selected, maybe its not, but either way, it's a lot more data. This was always the problem with Lore Sheets for me - while brilliant, they also consist of two or three printed pages of material apiece, which means they're either pretty awkward to juggle or require some aggressive photocopying (and the additional organizational burden of that). Using 4e backgrounds would introduce similar complications. But part of that limit has always been my fondness for cards. Ideally, I want the hook on one side of an index card, and the details (or questions!) on the reverse. That works, but it limits scope. And that's where envelopes start getting a little more interesting. Yes, it totally requires more printing/photocopying and some organization, but the result could be very satisfying, especially with a little bit of extra crafty flair (nice paper, wax seals and such). Now, there's nothing demanding that you go the extra mile in this. You could just have a list and have players pick from it, and that would be that. But this is a hobby of imagination and flair, and there's no reason that shouldn't apply the most when you're drawing people in. Whatever specific thing you intend to do with hooks and background, put in the little extra effort to make it fun and exciting for your players. The payoff in investment will be larger than you expect. Not sure if this is a handout or just a placeholder, but it fell onto my screen tonight. Make sure to keep the NPC cards. 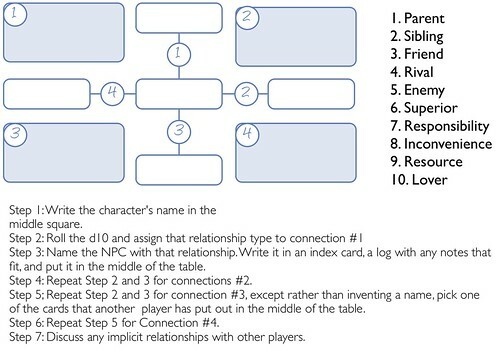 If you do this more than once, you can start adding them to the table beforehand and changing the number of new vs existing NPCs used.